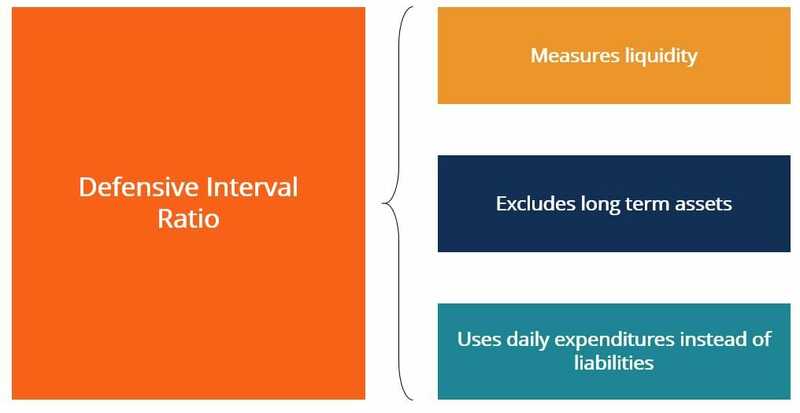 What is the Defensive Interval Ratio? The defensive interval ratio (DIR) is a financial liquidity ratio that indicates how many days a company can operate without needing to tap into capital sources other than its current assetsCurrent AssetsCurrent assets are all assets that can be reasonably converted to cash within one year. They are commonly used to measure the liquidity of a company. A company’s assets on its balance sheet are split into two categories – current assets and non-current assets (long-term or capital assets).. It is also known as the basic defense interval ratio (BDIR) or the defensive interval period ratio (DIPR). Sources of capital include long-term assets such as a company’s patents or PP&EPP&E (Property, Plant and Equipment)PP&E (Property, Plant, and Equipment) is one of the core non-current assets found on the balance sheet. PP&E is impacted by Capex, Depreciation and Acquisitions/Dispositions of fixed assets. These assets play a key part in the financial planning and analysis of a company’s operations and future expenditures investments, which have relatively poor liquidity. This means they might take considerably more time to sell off at their fair market value. Typically, long-term assets cannot be sold in the current accounting period. They usually take upwards of one year to liquidate. Examples of long-term, less liquid capital include a company’s external sources of capital that would require time to see cash flows from (e.g., issuing new debt or equity). A key difference between the defensive interval ratio and other ratios is that the DIR does not compare the company’s current assets to current liabilitiesCurrent LiabilitiesCurrent liabilities are financial obligations of a business entity that are due and payable within a year. A company shows these on the balance sheet. A liability occurs when a company has undergone a transaction that has generated an expectation for a future outflow of cash or other economic resources.. Rather, it compares the company’s current assets to the company’s daily cash expenditures. As a result, many analysts believe that it is a better ratio to utilize when assessing the liquidity of a specific company. The ratio is labeled “defensive” since it incorporates the company’s current assets, which are also called defensive assets. Many analysts believe that the DIR is a better liquidity ratio to use than the classic quick ratioQuick RatioThe Quick Ratio, also known as the Acid-test or liquidity ratio, measures the ability of a business to pay its short-term liabilities by having assets that are readily convertible into cash. These assets are, namely, cash, marketable securities and accounts receivable. These assets are known as "quick" assets since or current ratio. This is because the DIR measures a company’s short-term liquidity in regard to its daily expenditures. Also, the DIR provides analysts with a number of days, rather than a ratio of the company’s assets to liabilities. This makes it easier to interpret as a measure of liquidity. Knowing that a company can remain liquid for “X” number of days without tapping into its long-term assets is an easily grasped point of reference. This is perhaps more readily than the knowledge that a company has a quick ratio that is greater than one. That being said, the defensive interval ratio, by itself, does not provide significant context about the company’s situation. Therefore, the ratio should be compared to the DIR of comparable companies in the same industry in order to gain insight into the company’s relative performance. The DIR can also be compared to the company’s own historical DIR to see the liquidity trend over time. Suppose that a company currently has $40,000 in cash, $10,000 in accounts receivable, and $20,000 worth of available for sale securitiesAvailable for Sale SecuritiesAvailable for sale securities are the default categorization of securities that companies decide to invest in for the purposes of benefiting their financial. The company has $300,000 in annual operating expenses and incurs $25,000 in annual depreciation. What is its defensive interval ratio? Using the equation above, we can see that this company has a DIR of 92.9 days. As always, this number does not mean much by itself and should be compared to company historical DIRs and competitor DIRs in order to draw additional insights.